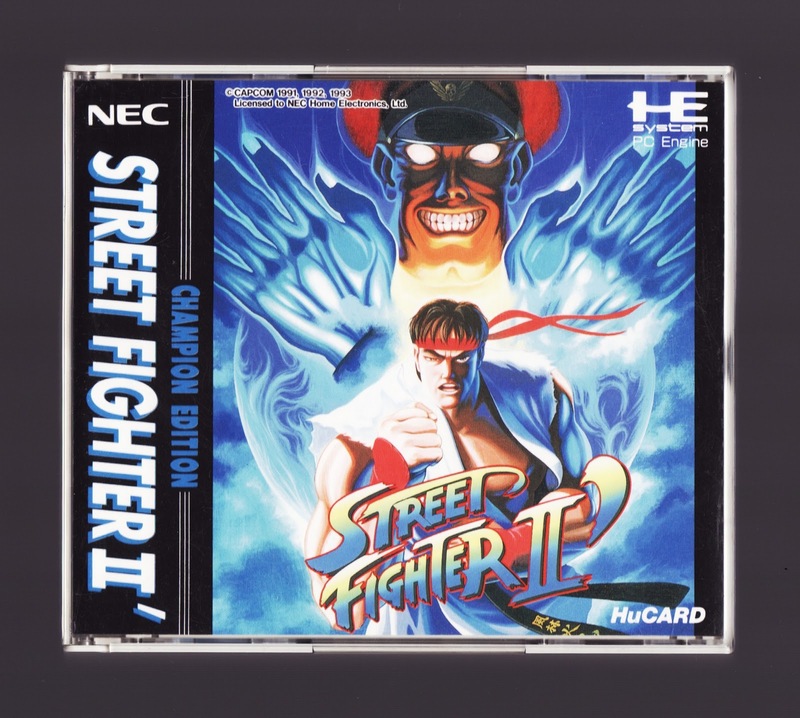 Nowadays, this port is the definition of "meh-worthy," thanks in large part to Capcom's milking of the Street Fighter franchise. 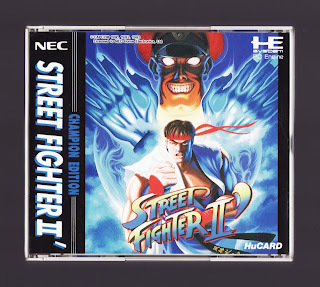 Back in the day, though, it was a marvel, as it proved, once and for all, that NEC's pint-sized--and basically 8-bit--PC Engine could compete graphically with its 16-bit competitors (those being Nintendo's Super Famicom and Sega's Mega Drive, of course). Admittedly, the music and sound effects took a pretty big hit in the transition from arcade to (20-Megabit) HuCard, but everything else in this port is pretty much spot-on--it even includes the barrel-breaking bonus stage that was cut from the Super Famicom version of the game. All that said, I rarely play Street Fighter II' Champion Edition. In part, that's because I'm not the world's biggest fan of one-on-one fighting games, but it's also because I have yet to pick up the six-button controller that was released alongside this title and is a required purchase if you want to get any enjoyment out of it at all. Hey there, Simon! Yeah, playing this version with a two-button pad is both atrocious and pointless. The graphics are a marvel, though, esp. for the time -- and considering the PC Engine is really just an 8-bit system on steroids. 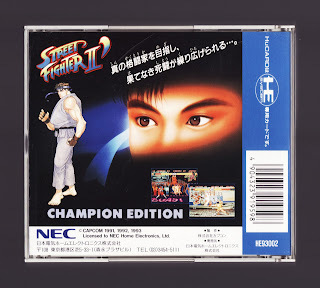 It's hard to be wowed by it today, honestly, but back in the day I was amazed that the folks at Capcom and NEC Avenue were able to do such a great job with this port/conversion. Not sure what to say since I have no knowledge of this port so I'll just say it must be decent at the very least. Motherplayer: Yeah, it's definitely decent. More than decent, really. The graphics are spot-on -- although it's possible the characters are a *bit* smaller than their arcade counterparts -- as is the gameplay, when the game's played with a 6-button controller. The music/sound effects are a bit off/wonky, but that's OK, IMO. Are the attacks pressure-sensitive, or is the same level damage for punches and kicks throughout? Pressure-sensitive i.e similar to how the Gameboy ports of the game where an attack's strength depends on the length of the button press, and yes, that reads as just about unplayable. Oh, I didn't know a GB version of SFII was even released! Honestly, that method of dealing with attacks actually seems preferable to the one used here. At least there's the option for the six-button controller, though. The Neo Geo Pocket fighters use a pressre sensitive scheme as well. Works really well for SNK fighters since they use 4 buttons. After playing a bit of street fighter competitively a while ago with the fantastic Irish fighting game community though it would be sacrilege to play with anything less than the full six buttons. The PC Engine version looks fantastic, much more colourful than the Megadrive edition any way. It's got a reputation of being a very good port. Huh. Thanks for the info, Retr0gamer! For some reason, I just can't imagine how this "pressure sensitive" mechanism works in action. I guess I'll have to try out some of these games that use it soon. As for the PCE port of SFIICE being a good port: Yes, I'd definitely say it is. In terms of graphics, I'd say it's damn near amazing, esp. for the time. I takes some getting used to but it does work nicely. However the NGPC fighters are built from the ground up around the two button limit on the system so it works better than a half assed port like SF2 on the Gameboy. The fact that the SNK games are based around a 4 button system also helps. They did it for money :) Sure there's some really bad fighting games like the mortal kombat games and even killer instinct on the gameboy. To say they are not the best is an understatement.